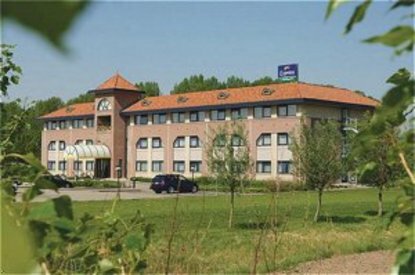 The Express by Holiday Inn Moerdijk hotel offers 61 comfortable guest rooms with TV and in-house movie system, direct dial telephone and a work desk. All rooms have an ensuite bathroom with toilet, power-shower and hairdryer. In addition, the hotel has a spacious complimentary car park and surrounding gardens. Wake up in the morning to a complimentary breakfast buffet in our Great Room and relax in the evening at the bar in front of the large screen television. The hotel is ideally located for day trips to the ever popular fairy-tale amusement park The Efteling. Or for the culturally minded, a visit to the historical town of Willemstad will always be worthwhile. Wildlife enthusiasts will enjoy the National Park De Biesbosch which also boasts a wide variety of watersport facilities.The Express by Holiday Inn Moerdijk hotel offers professional meeting facilities up to 55 people and wireless high-speed internet access is available troughout the entire hotel. We recommend Kanters Restaurant located on the premises for your lunch and dinner.